Every day riders face the potential of being injured in a fall. 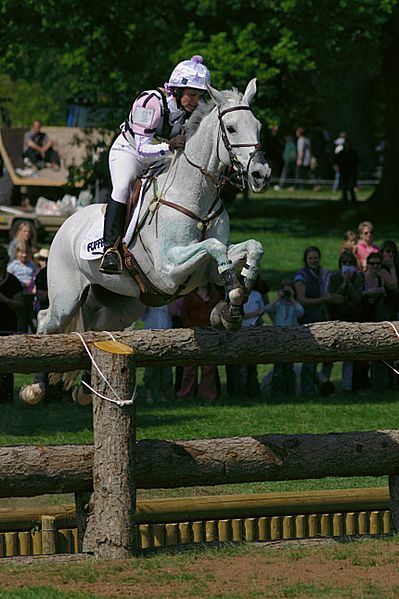 Event riders are particularly susceptible to serious injury, given the fact that they jump solid obstacles at high speeds. The invention of the air vest has the potential to increase rider safety, especially on the cross-country course. Even if you don’t event, the technology used in the air vest could help to protect you in the future. Whenever a horse attempts to clear a solid fence, there is the potential of a rotational fall. This is one of the reasons that it’s so important to carefully select your horse fencing for safety. The rotational fall is a fear of every eventer – if a horse catches his front legs on a fence as he jumps it, the force of the jump can cause him to rotate over the fence, landing on his back. Riders are sometimes trapped beneath the horse, and such a fall can seriously injure or kill a rider, along with causing serious injury to the horse. The air vest was invented to help protect riders from both rotational falls and the serious impacts that can occur from other falls on the cross-country course. Using technology similar to the air bags in cars, the vest can be worn discreetly while on course. Outfitted with pressurized air canisters, the airbag system of the vest is activated by a pull cord. When mounted, the rider clips the cord onto his saddle. If he becomes separated from the horse, the cord will activate the vest, which will rapidly inflate. The air vest has been on the market for a number of years now, and steadily gains popularity on the cross-country course. It is worn over a traditional eventing safety vest, and its inflatable design helps to keep it out of the way until it is needed. Once inflated, the vest surrounds much of the rider’s upper body with a cushion of air. The vest extends up around the back of the rider’s neck and helps to protect the neck, back, hips, and chest. Currently air vests for horseback riders are largely manufactured by two companies: Point Two Air Jackets and Hit Air. Their prices typically range between $400 and $700, but it is possible that as the technology continues to develop, other alternatives may emerge. Despite the high price point, the vests are becoming a frequent sight on the cross-country course, and top riders such as Oliver Townend and David O’Connor have voiced their support for the air safety vests. Just how the air vest might be adapted for everyday riders is yet to be seen. The technology is still new, and extensive studies of the protection offered to riders by air vests have not yet been performed. Still, the vests are widely regarded as being a positive addition to the protective equipment available to riders.